Christmas may be over but we are here for you with a post-Christmas present: a special bonus episode of the AFA Podcast! Rachael, Dan, Chris and Yvonne (who was fashionably late) are here to talk about Disney's Moana. Before we got into our extended discussion of the House of Mouse's latest feature, we covered a few news stories for the last time this year! We talked about The upcoming new anime Boruto: naruto Next Generations The casting of the new DuckTales (0:16) and the release of Ocean Waves from Studio Ghibli. 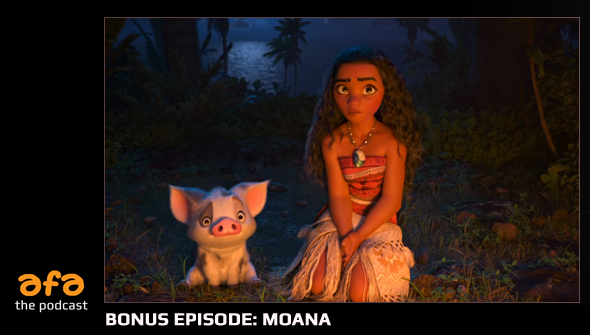 Then we get in depth into Moana, (0:34) with a general discussion at first, with spoilers starting at around 1:08. Please note: Part of the episode features more background noise than would be ideal, but unfortunately it was beyond our control. Sorry! It's not too bad though.